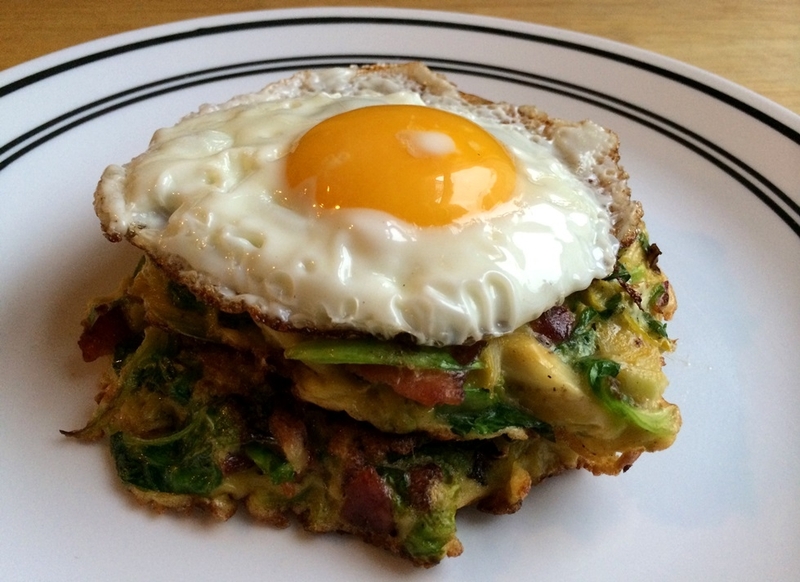 Shredded brussels sprouts are sauteed in bacon fat and combine with crispy chopped bacon and egg to form these brussels sprouts and bacon hash browns, a tasty alternative to potatos. Serving size & nutritional information is for 1 hash brown to eat as a side - have 2 for a full breakfast meal. 1. Lay bacon strips flat in a large, cold non-stick skillet, then cook over low heat until it starts to release from the pan and curl up. Turn strips over and cook until crispy. Remove from heat, using tongs to transfer bacon to a paper-towel lined plate to absorb grease. Chop up the bacon into small pieces and transfer to a mixing bowl. Set aside. 2. While bacon is cooking, cut the brown ends off the brussels sprouts, then shred brussels sprouts by either using a food processer, or cutting the brussels sprouts in half, then slicing into thin strips. 3. Pour out the grease in the skillet, reserving 1 tbsp. of bacon fat. Add 1 tbsp. of olive oil and turn heat to medium. Add shredded brussels sprouts, salt, and pepper and saute for 5 minutes, stirring occasionally. 4. While brussels sprouts are cooking, scramble 2 eggs and 1 egg white. Add raw scrambled eggs, sauteed brussels sprouts, and a sprinkle of grated parmesan cheese (optional) to the mixing bowl with the chopped bacon, stirring all ingredients to combine and disperse egg evenly. 5. Heat 1 tbsp. olive oil in the skillet over medium-high heat. Spoon brussels sprout mixture into the pan and flatten to create a hash brown 3-4 inches in diameter and about 1/8 inch thick. The mixture should be enough to create 4 hash browns of this size. 6. Cook hash browns for 3-4 minutes (you should be able to slide a spatula under the hash brown cleanly - if not, let it cook longer). Flip and cook on the other side for another 3 minutes until the hash brown is brown on both sides. 7. Serve immediately with your favorite style of eggs.